SO MANY NOODLES. So many. 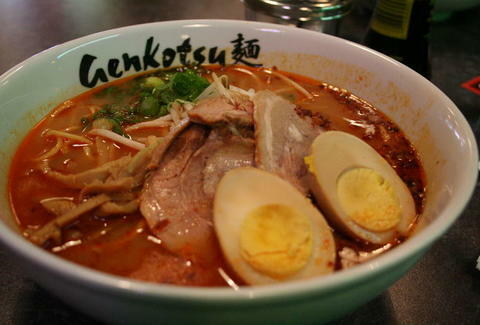 Genkotsu's a midsized ramen house w/ bottom-lit bar, plush, couch-like seating and a restaurant-wide exposed brick wall, all from a guy whose family owns the longest-standing Japanese restaurant in the US, and whose mother was America's first female sushi chef, thanks to the little known equal-chef-rights law, Title Dine. Their specialty's Tonkotsu (pork-bone ramen), with piggy options flavored by either soy sauce, salt, or miso, all of which are jammed w/ roasted kurobuta pork, bean sprouts, green onion, boiled egg, seaweed & bamboo, and available w/ your choice of noodles: thick & straight, thick & curly, thin & straight, or thin & curly, also the name of the Three Stooges unsuccessful spin off, starring Curly and a range of seductively bored models. If you're not feeling the pig, they've also got chicken and seafood ramen, as well as rice w/ spicy cod roe, oysters on the half-shell, and a slew of gyoza, including one stuffed w/ a single shrimp (so think of it as an edible Middle School Locker). They've also got a full bar, as well as 5 beers on draft (including Asahi), and on weekends they're planning on having live music and being open past last-call, giving you the chance to capitalize on your family's reputation of never knowing when to go home. After all, you're a Barrymore.